Each year, AmericanStyle magazine compiles a list of readers' favorite art fairs and festivals in the United States. Cast a vote for your favorite before the midnight deadline today. Two weekends ago, I trekked up to NYC to do some prospecting at two retail craft shows, the Renegade Craft Fair and Crafts at Lincoln Center. To say the least, it was an interesting juxtaposition of the emerging craft world and the old school version. Despite its hard-to-find location in an abandoned swimming pool at McCarren Park (to be fair, it probably wasn't so hard to find if you live in Brooklyn, but three out four Manhattan cab drivers had no idea how to get there), there were literally thousands of visitors at the Renegade show. Until the skies opened and vast amounts of rain poured down later in the afternoon, it was HOT (a situation not improved by having a show in a giant concrete hole), but the crowds were buying nonetheless. On the opposite end of the spectrum, I spent Sunday morning at Crafts at Lincoln Center, held outdoors on the plaza at - you guessed it - Lincoln Center for the Performing Arts in Manhattan, an easy to get to, easy to find, well-known location. The work on display was lovely and well-made contemporary craft work -- jewelry, ceramics, wearable fiber, mixed media and a small number of glass artists. Price points were varied; you could certainly take home any number of items at a reasonable price (I purchased an adorable handmade dress for my daughter for only $20). The weather was fair, with a small rain shower in mid-morning. The crowds, however, were thin, especially as compared to what I had seen in Brooklyn the day before. I don't have access to the financial information of the two shows, but I would guess that booth fees in Brooklyn were less expensive than Lincoln Center and that Renegade's marketing and advertising budget was quite a bit smaller than that of Crafts at Lincoln Center. The one thing I can point to is the power of the internet and word-of-mouth -- virtually every artist at the Renegade show has a blog. Linked to other blogs. All of which had postings about the show. Most of those artists also have websites with the ability to sign up for email updates -- I received at least ten messages the week before Renegade reminding me about the show. Stay tuned tomorrow for a post on the interesting juxtaposition of shows I was at this weekend - the Renegade Craft Fair in Brooklyn and the American Crafts Festival at Lincoln Center. New school vs. old school... who won? What is your favorite art fair? AmericanStyle magazine is surveying readers for its annual Top 10 Art Fairs & Festivals issue. 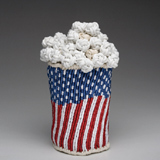 Vote for your favorite retail art fair/festival online at www.americanstyle.com or use the ballot in the August issue. An added incentive: one lucky voter will be chosen at random to receive a $500 travel gift certificate! If you're looking for some inspiration this weekend and you're in the vicinity of NYC, head over to the Park Avenue Armory for SOFA (Sculptural Objects and Functional Art), continuing through Sunday. Dozens of galleries will be exhibiting and selling works by the likes of Dale Chihuly, Wendell Castle, George Nakashima, alongside pieces by emerging and mid-career artists. A number of us will be visiting the Smithsonian Craft Show tomorrow. If you're in the area this weekend, it's a not-to-be-missed show -- among most prestigious contemporary craft shows in the country. William Lasley, the craft business expert on About.com, has this interesting article with tips for fighting back against the "Wal-Mart Mentality." This is mainly encountered at retail craft fairs when a shopper says something like "I can get this cheaper at Wal-mart." Check out the article for a more detailed explanation. And while you're there, William has posted many other helpful articles. Enjoy! This show features more than 400 artists, including some of our exhibitors. Stop by and see Baa Baa ZuZu, Davin and Kesler, Inc. , Elements/Jill Schwartz, Jes 'Irie' Wear, Kristin Lora Studios, Trippworx, and Mark Orr, among others! Baltimore's first D.I.Y craft fair has two dozen exhibitors, including The Rosen Group's very own Claire Patterson, who will be selling her handbags. More than 100 professional artists open their studios to the public. Be sure to stop by the studios of J. Brooke Patterson, R. Strong Glass, and Lynne Meade.